As tonnes of material per hour are quickly dropped with great force through receiving chutes onto a receiving conveyor, fugitive cargo often piles up around the frame and dust migrates throughout the area, collecting on idlers, pulleys and floors and affecting air quality. Workers have to continuously clean up the material before it encapsulates the belt, potentially exposing them to a hazardous work area around a moving conveyor, where even incidental contact can result in serious injury in a split second. Considering that most conveyor injuries occur though routine maintenance or clean up, controlling fugitive material is becoming one of the primary elements in a well-organised effort to reduce hazards and prevent injuries. In a properly-engineered transfer point, each component, from the chute design to the cradles and dust seals, is employed to maximise its specific function and contain dust and fines, while at the same time offering workers easy access for maintenance. Containment is the key to avoiding spillage and dust, and there are a number of components designed for this purpose. Although shaped transfer chutes and rock boxes direct the material flow to mitigate the concussion of material on the belt, most high volume operations need one or more impact cradles to absorb the force of the cargo stream. Heavy-duty impact cradles can be equipped with rubber or urethane impact bars with a top layer of slick UHMW plastic to minimise belt friction. Able to withstand impact forces as high as 17 000 lbf (53.4 - 75.6 kN) and drop heights of up to 50 ft (15.2 m), support beams in the centre of the cradle are set slightly below the receiving belt’s line of travel. In this way, the belt avoids sustained friction when running empty and yet can absorb hard impacts during loading, while still retaining a tight belt seal. 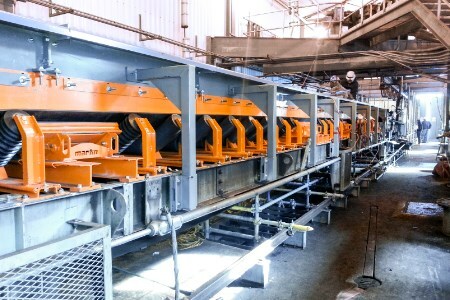 Within the settling zone – located after the impact cradle in the conveyor chute box – slider cradles can then create a troughed belt to centre the cargo and reduce disruption quickly, aiding in dust settlement. Slider cradles, located down the length of the skirted area, have several functions. One is to create a trough angle that adequately centres the load. The trough angle also plays an important part in retaining a tight seal between the belt and the skirt. Lastly, utilising track mount idlers in between each cradle, a smooth belt path is created through the settling area, one that can be easily maintained. A smooth belt path should have no gaps, minimising disruption and promoting containment, allowing dust and fines to settle into the cargo stream prior to leaving the containment area. By closing gaps and keeping a tight seal on the belt, apron seals can also be attached to the chute walls to prevent fugitive dust and fines from escaping. “A crucial requirement in any transfer point designed for reduced spillage and high efficiency is an effective skirting and wear liner sealing system at the edge of the belt,” explained Heitzler. Managers concerned with the overall safety and cost of operation need to review potential hazards, the impact of rising labour costs for cleanup and maintenance, combined with the expense of potential fines or forced downtime, to determine specifically how they can affect the bottom line. Using the technologies described here, even poorly-performing conveyors often don’t need to be replaced or rebuilt, but merely modified and reconfigured by knowledgeable and experienced technicians installing modern equipment. “These improvements will help operations improve efficiency, reduce risk and contribute to regulatory compliance,” Heitzler added.